With Restaurant Technology Live (RestTech Live) just around the corner (2728 September), the SIS Digital team is pleased to provide the following commentary on digital menu boards and how effective they can be in improving the ROI for any restaurant. No-one likes to queue... especially when they are hungry! A digital menu board provides customers with visually engaging content that boosts the opportunities for up-selling and streamlines the ordering process. 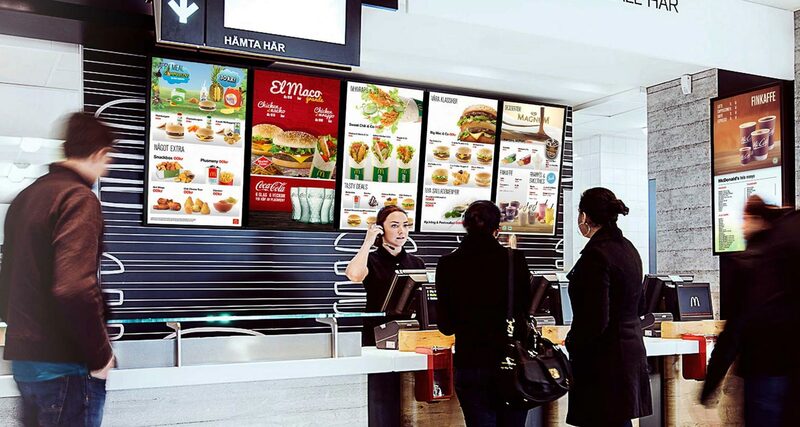 In fact, digital menu boards have been shown to reduce perceived waiting times by as much as 35%. They are eye-catching and influential. Our eyes are drawn to motion, light and colour, and over 65% of people report that they find animated content more eye-catching than print. Digital menu boards transform traditional, static and unresponsive menus into vibrant, attractive and effective sales tools, with research suggesting that 29.5% of customers find they directly influence their purchases. They are simple to use and highly adaptable. Does your restaurant still promote that delicious summer salad when  out of the blue  the weather takes a serious turn for the worse? Digital menu board content can be updated instantly, enabling restaurants to react to the weather, time of day, local events, news and other demographics that can affect sales  all at the touch of a button. They are ideal for restaurants and fast food chains. It's true that big restaurant chains love digital menu boards  with Burger King, for example, reporting a 64% rise in sales just 12 months after installing them in its London and Birmingham outlets. And it's easy to see why! The ability to manage an entire network of screens from anywhere with an internet connection ensures branding is always consistent, and enables promotions to be rolled out nationwide instantly. See also Harry Ramsden's moves to digital menu boards. They are cost-effective, boosting sales. Unlike traditional static menus, digital menu boards have no on-going print or shipping costs. Managing content remotely frees staff for more productive duties, and the screens can even be used in staff training. Integration with social media can further boost brand awareness and reach, as well as assisting in market research. The ability to tie content to local events can help to keep the local community and trade engaged. In short digital menu boards are now a must-have tool for any restaurant  whether it's a single screen or a fully integrated display with touch-screen ordering. The market for digital signage continues to grow, and with our customers reporting sales increases of as much as 40 to 60% after moving to digital signage, it shows no signs of slowing down. Eclipse Digital Media: Top benefits and ROI of digital menu boards 2014.